TILDA and Trinity EngAGE - Centre for Research in Ageing, recently hosted a meeting of the European Research Area Committee, at the request of Department of Jobs, Enterprise and Innovation. The meeting was held as part of Ireland’s EU presidency and representatives of AbbVie, a global biopharmaceutical company, also took part in the event. 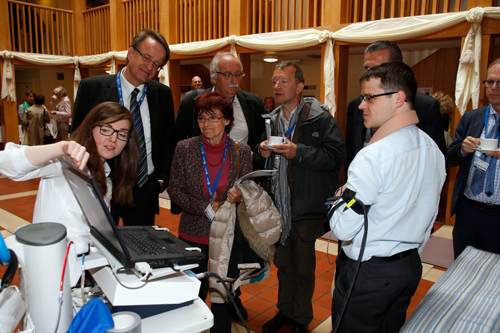 Pictured above, TILDA researchers Dr. Celia O'Hare and Dr. Matthew O'Connell demonstrate a technology for cardiovascular health, the Finometer, to ERAC guests. Find out more.